The walking stopped on Nov. 10, opening day of gun season in North Carolina’s Central deer zone. When Watson approached the buck after dropping it in its tracks at 168 yards, there was no ground shrinkage. He was a beast. A main-frame 5x5 with two sticker points, the buck carried a tall, heavy rack with an inside spread of 18 1/4 inches. The tallest tines on each antler are 11 inches long, and the next set of tines are 10 1/2 inches long, putting the buck in the 150-inch class, at least. “This is the third year I had him on camera,” Watson said. “Last year, he was a main-frame 10-pointer with the same kickers, but he wasn’t as tall or wide. He might have been 120 or 130 inches. 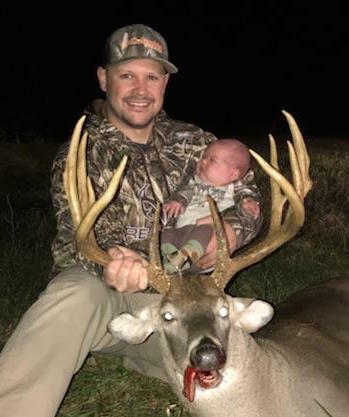 Watson finally got a chance at the buck this year on an afternoon hunt on the family farm, which was planted in soybeans and corn this year. Watson saw the buck first ease up to a barbed-wire fence before he came to the does. Shooting a Browning A-Bolt in .308, he sent a 168-grain hand-load in the buck’s direction, 168 yards distant. The bullet took the deer cleanly through the heart. Watson guessed the buck, which weighed 201 pounds on the hoof, at 4 1/2 years old.